The international nature of the SKA is one of its greatest strengths, bringing together experts from a wide range of backgrounds who are all focused on one common goal. Among them is Rodrigo Olguin from Chile, a Frequency and Timing Domain Specialist and System Engineer for Signal and Data Transport (SaDT), who is based at SKA Headquarters in the UK. 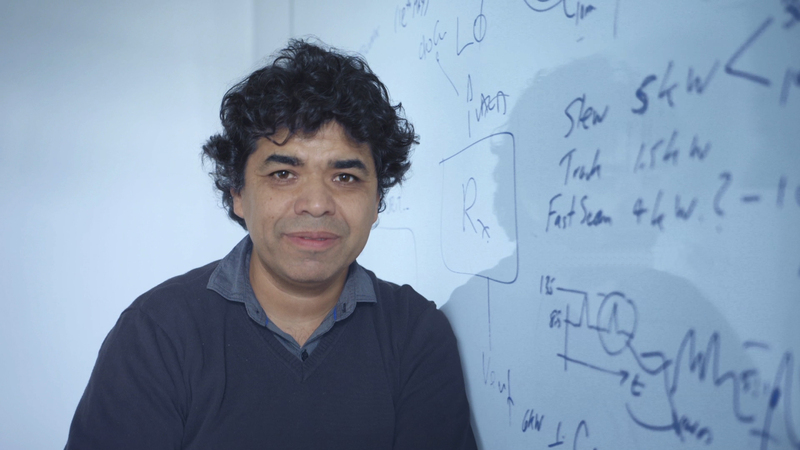 Rodrigo was a panel member for the SaDT Critical Design Review (CDR) in May 2018, so we caught up with him to learn more about his role, what brought him to the SKA, and how starting a rock band led to a career in engineering. Growing up in Chile, did you always want to be an engineer? Not always, I started with common childhood dreams: being an astronaut, a mad scientist, a football player. When I was a kid I was very influenced by Sci-Fi movies and cartoons on TV. My home town was a country place with a tradition of folk tales about witchcraft and indigenous legends, so in a time before console games or the internet my imagination was really stimulated. I always wanted to know how things worked or happened, why paint had colour or how music could be stored in a tape. I used to read many books looking for answers. In 1986, Halley’s comet was visible but was very dim. My mom managed to get me a set of binoculars and I spent an entire night on the roof of my house, only to see nothing but blurred stars. When did you decide to pursue engineering as a career, and what triggered it? At secondary school in Chile I was interested in many different things: physics, music, maths, philosophy, languages. At university I chose to study engineering, thinking I was going to learn about making my own guitar amplifiers, but at that time the university didn’t teach technical skills – resources for labs were scarce. In my disappointment at just looking at engineering in books, I started a rock band and with the band I learnt to solder, to do some fixings on amplifiers and set up small audio systems. In the final years of my studies I was able to get into labs and make circuits on breadboards, etching PCBs [printed circuit boards] on ferric chloride, programming micro controllers and playing with wireless communications. At that point I decided I would like to be an engineer. 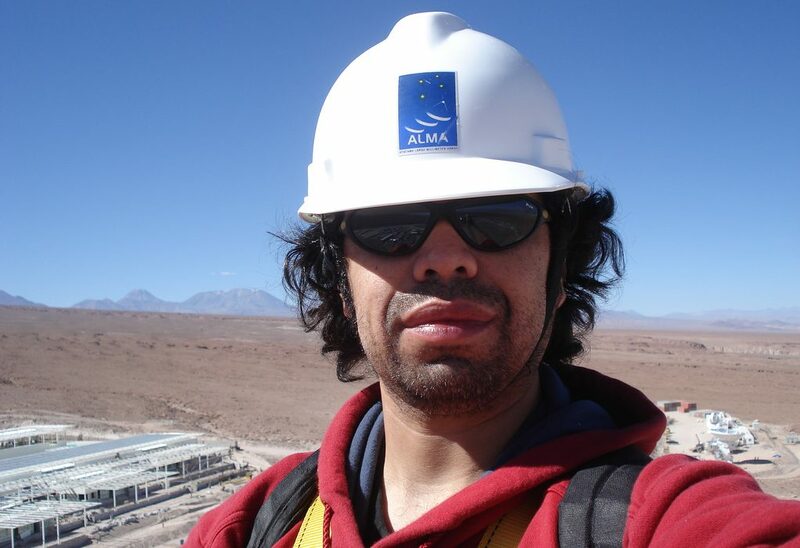 Rodrigo spent six years working at ALMA, the Atacama Large Millimeter/submillimeter Array, located high in Chile’s Atacama desert. © 2018 Rodrigo Olguin. All rights reserved. You previously worked at ALMA, another major radio astronomy observatory in Chile. Tell us about your experience working there, what was special about ALMA? ALMA was spectacular, a hi-tech facility being built on top of the mountains in the middle of the desert. I cannot tell you how unique that was, and how I felt I was finally doing real engineering. I joined as an AIV [Assembly, Integration and Verification] engineer, but being a complete rookie in radio astronomy at the beginning everything about the telescope was black magic to me, and my relatives and friends couldn’t really understand what my job was about. I worked there from the prototype system integration at the VLA [Very Large Array] site in Socorro, New Mexico, to when the observatory was inaugurated and started science operations in Chile. I witnessed the entire process, from having nothing at the base camp but an interim facility, to the deployment and integration of the array at the high site [Array Operations Site, located at 5000m altitude]. Sometimes I think of that experience as being equivalent to the construction of Egypt’s pyramids thousands of years ago. Why did you decide to join the SKA team? I was doing a master’s degree in astronomical instrumentation when the SKA Organisation advertised engineering positions at the HQ for the telescope design process. Design was something I missed at ALMA and now the future world’s largest radio telescope had an opening for that. I felt ready for it, to learn the connection between science and engineering. I also wanted the experience of living abroad, and my partner shared the idea of having a new adventure far from home. Tell us one thing that you find amazing about the SKA. The sun never sets in the SKA world! The SKA is happening in so many places and will be realised with gigantic installations on two different continents. It is a massive global project with the purpose of helping mankind find answers and showing that we as a world community can work together regardless of where you were born, your skin colour or economic condition. 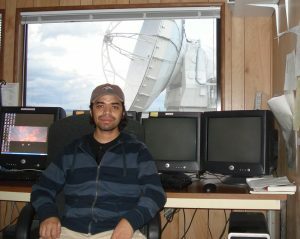 Rodrigo at the ALMA Test Facility in New Mexico during prototype system integration in 2007. © 2018 Rodrigo Olguin. All rights reserved. There is a huge skills shortage around the world in STEM fields. What would you say to young people to encourage them to get into engineering or science? The way we develop our careers has changed significantly compared to what our parents and grandparents did; what you choose to study first is not necessarily what you will do for life. Maybe you feel interested in things that you think have nothing to do with engineering or science, say arts or humanities, but there is a big overlap that makes them closer than you might think. It is never too late to change fields, and it’s true that a lot of engineers and scientists are needed, but philosophers, artists and journalists are also necessary for this world to work. Maybe a world made only of engineers would be perfect, but perfect is boring! What is special about this career is how it starts with a specific problem or wish, and then comes an idea – you work and work on it until at some point it becomes something concrete in the real world. Today the SKA is a telescope on paper, but one day it will be watching the sky in South Africa and Australia. From your experience, what kind of skills does one need to be a good engineer? A good engineer loves to find solutions to problems, for that you need to develop analytical skills, not just in mathematics and physics, but also grammar skills in reading and writing, as being able to properly understand and share written information is key. Communication skills are very important, especially when working in teams. Never forget that although engineers spend most of their time looking at machines, systems and technologies, at the end of the day they work for and with people. There is also one skill that for me is extremely valuable but not always very appreciated in the quest of solving problems: common sense. 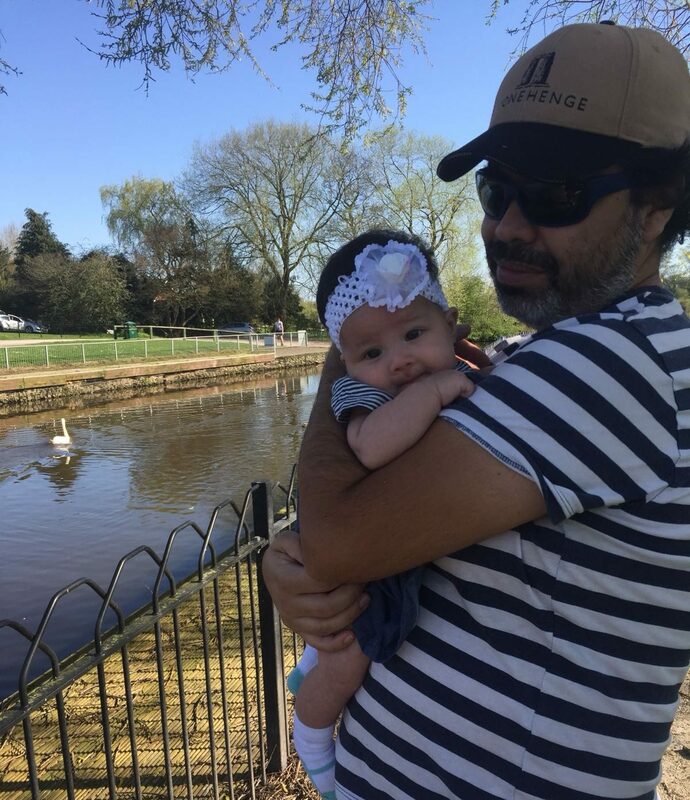 Rodrigo and his wife welcomed their daughter in Chile and he was able to work remotely from there before returning to the UK. © 2018 Rodrigo Olguin. All rights reserved. Life is the UK must be quite different from Chile – what do you miss the most? We are settled here but I miss seeing my family, lifelong friends and the old pals that play music with me. Of course, having my mother’s food and all the Chilean food that we cannot reproduce here. And I miss going to the beach any day of the year. You recently became a father – congratulations! Has that changed your outlook on life, and particularly work-life balance? What kind of support have you received at work? The SKA Organisation has been sympathetic and supportive to us; my line manager has done whatever he can to help me during this period. I must say that our friends at the SKA have been so nice, visiting us and arranging a little gift for our baby. For work-life balance it is a game changer; I have less free time and have to be clever to find that point where dedication to family, realisation of work duties and time for leisure all have a space. Being a father for me is a brand new dimension of emotions and warm feelings that inevitably changes my view of everything. On one side I feel a big responsibility and would like to be better at predicting the future, but on the other side everything is repaid by seeing the happiness of my wife. Read more about Rodrigo’s role in the SaDT Critical Design Review here, and learn about the SKA’s other design elements by exploring our new CDR site.